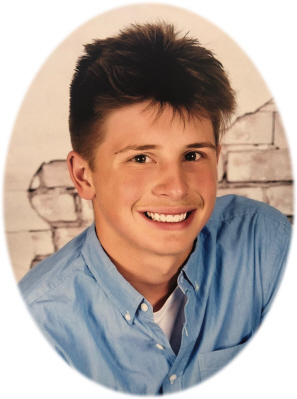 Carson James "Vinnie" Vincent age 17, of Elsie, MI, passed away Sunday, September 16, 2018. A Memorial Service will be held at the Ovid Elsie High School Gym on Friday, September 21, 2018 at 12:30 P.M., with Mr. Everett Smith officiating. Visitation will be held on Wednesday, September 19, 2018 from 4:00-8:00 P.M. and also on Thursday, September 20, 2018 from 2-8 P.M. with family present from 2-4 & 6-8 P.M. at Smith Family Funeral Homes - Houghton Chapel, Ovid, MI. Carson was born in Owosso, MI on November 10, 2000 the son of Jeff and Michelle (Martin) Vincent. He graduated from Ovid Elsie High School with the class of 2018. He was very active in football, track and field and basketball. He held many records at the school including, field goal percentage, over 1000 points and the second highest scoring player in Ovid-Elsie's basketball history. Carson was attending Mid Michigan College in Mt. Pleasant where he was also on the basketball team. He enjoyed chicken tenders and bagels. Most of all Carson loved the time spent with his family and friends. He had a gift of making everyone laugh. He is survived by parents Jeff and Michelle Vincent of Elsie, MI; sister Makenna Vincent of Elsie, MI; great grandmother Jo Smith of Owosso, MI; grandmother Cathy Smith of Owosso, MI; grandfather Kim Martin of Palm Bay, FL; grandmother Bonnie and Butch Levitski of Owosso, MI; grandfather Leroy Vincent of Ovid, MI; uncle Kelly and Kelli Martin of Owosso, MI; uncle Chris and Becky Vincent of Ovid, MI; and aunt Deanna Vincent of Elsie, MI; cousins: Brena, Makayla, Lexi, Leah; and girlfriend Alyssa Carrillo. He is also survived by the Morris and Taylor families and many special friends including Alex Medina and Carter Davisson. He was preceded in death by his great grandfather Vern Smith. Memorials may be made to help the family with funeral expenses by clicking the contribute button to the left or by going to https://dm2.gofund.me/family-of-carson-vincent or for a future sports scholarship to be set up in honor of Vinnie. Online condolences can be sent to www.smithfamilyfuneralhomes.com. The family is being served by Smith Family Funeral Homes - Houghton Chapel, Ovid, MI.